Google News Badges: A Bad Idea? Home > Google News > Seriously Google! Badges For Reading News? Seriously Google! Badges For Reading News? Google News has announced they are now in the achievements and badge award game! Yay! 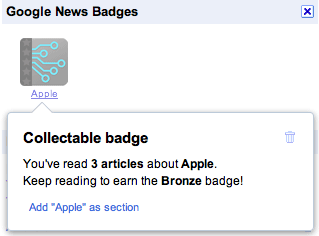 Google News will now unlock badges for reading news on Google News. The more you read, the more diverse your reading, the more badges you are awarded. Plus, the more you read on a topic, the higher level badge you'll receive, starting with Bronze, then moving up the ladder to Silver, Gold, Platinum and finally, Ultimate. So I then began clicking on other news, but the other badges didn't show up yet. Anyway, I don't think this is a good move. I'll predict that the badges are gone within the year. I think that is a good idea, not the news badges.